Much like a favourite song, a fine wine or a beautifully tailored dress, it can often feel like older is better. Indeed, in the world of interior design, many of us yearn for a bathroom that harks back to a classic era of shapes, materials and textures that fill you with a warm sense of nostalgia. However, this notion doesn’t always hold true. Many things can be improved upon, whilst still retaining all the elements that made them classic in the first place. 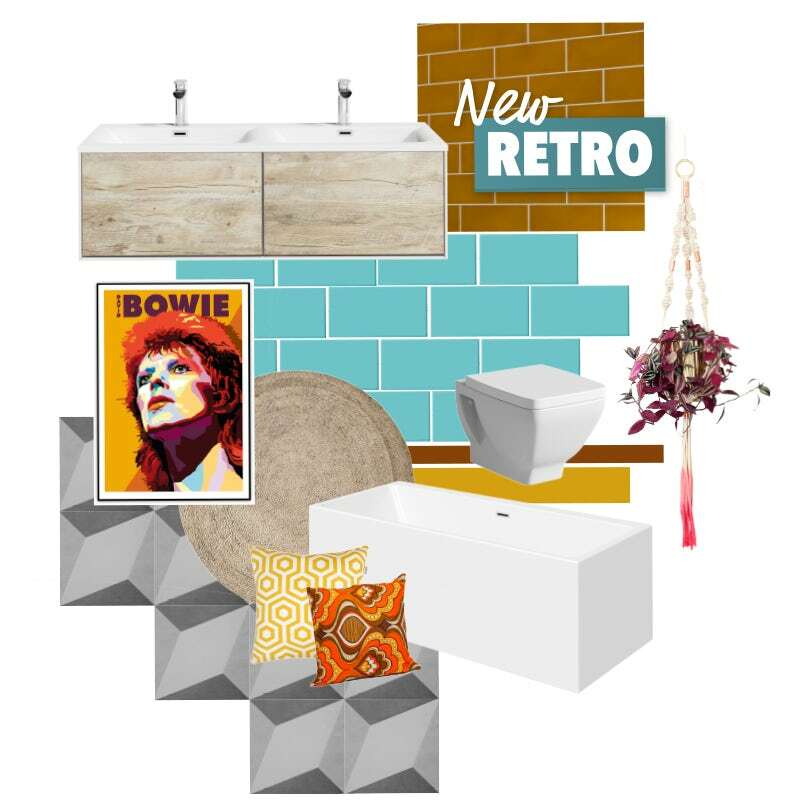 In part 1 of this style guide, I’ll introduce you to a look that we’ve named “New Retro”, as it draws heavily on classic retro styles from yesteryear, whilst combining more contemporary elements to enhance your surroundings. To understand the look, we first need to examine some of the influences that make this style so appealing. Why are retro interiors so popular? When we talk about “retro” in terms of interior design, we often mean “modern” style—encapsulating a specific time period, roughly from the 1920s through to the 1950s. This can often be misleading, as many people use the word “modern” as a catch-all term, referring to anything that isn’t traditional. The “modern” period of interior design was a time of huge social change and upheaval. During the interwar years, the old world of Victorian and Edwardian ornateness, intricate detail and splendour gave way to new types of design which favoured a simpler look with greater emphasis on function, rather than flair. Futuristic materials were developed and new textures started to be used, which resulted in furniture that could be shaped and coloured more easily. This meant that the drab shades of yesteryear could be swapped for vibrant, bold colours that really caught the eye and the imagination, and still do to this day. This modern type of design is now commonly referred to as “retro”, which can, in turn, refer to any time period from the recent past. However, in general, retro is perceived to be design from the 50s, 60s or even 70s. Handy hint: For a more in-depth look at modern interior design, check out our blog. 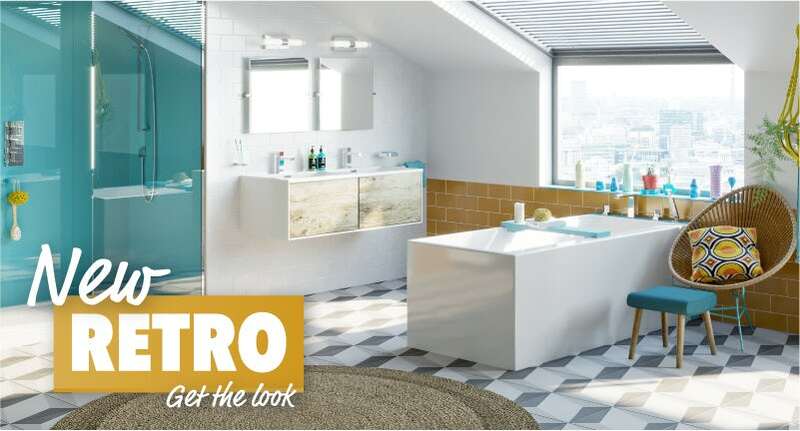 New Retro is all about blending those classic elements of bathroom design with those which are more contemporary, to create an eclectic mix of styles which can’t be pinned down to a single, simple definition. Your use of colour is very important. Modern style saw a breakthrough in colour blocking and use of different colour combinations, producing an interior that is bright and cheerful, rather than monochrome and pared back. 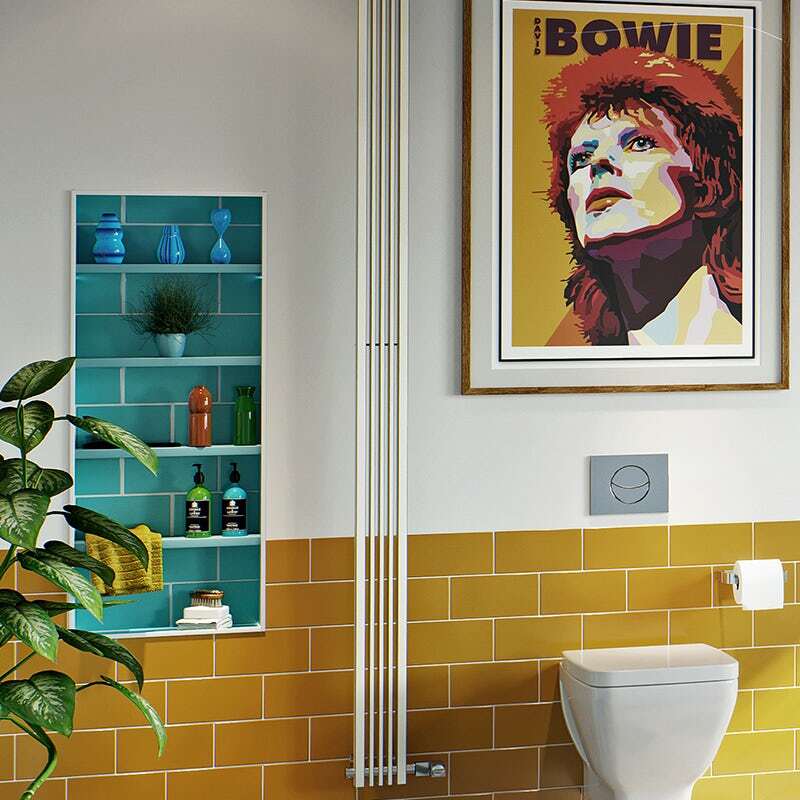 Handy hint: For more colour inspiration see our Colourful Creative bathrooms blog post. Geometric patterns first came to prominence during the Art Deco years but also found favour in the modern era. Floors, mirrors and accessories can all be used to introduce geometric shapes into the mix. Vinyl surfaces and the development of plastics and engineered wood, allowed designers to literally go to town with their products. Furniture should be simple, with little in the way of embellishments. Retro interior design is so popular, you certainly won’t struggle to find inspiration in all manner of places. Aside from all the usual sources, like Pinterest and home interest magazines, old family photos can be a fabulous resource, giving you ideas on the sort of décor that was used in the recent past. 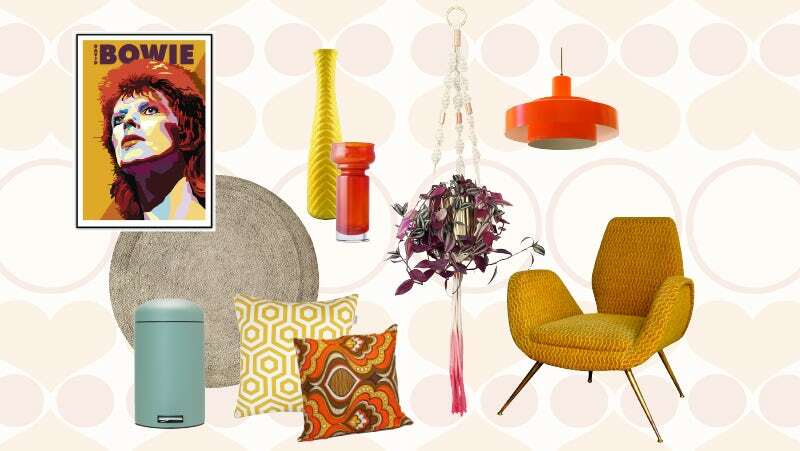 To help you visualise some of the elements, colours and textures, I’ve created my own New Retro mood board below. Of course, this only reflects my own personal tastes and preferences, so why not try it for yourself? Get a large piece of white card—your own blank canvas—and add inspirational retro images, paint testers, wallpaper, material and drawings. You’ll soon see which elements hit the mark. To find out how to transform your bathroom using the right products, colours, materials and accessories, click on the banner below and read part 2 of this style guide. In part 3 of this style guide, we’ll start looking at colours, patterns, textures and tiles. And, if you're ready to shop the look, head directly to part 4, where we'll show you exactly which products we used. 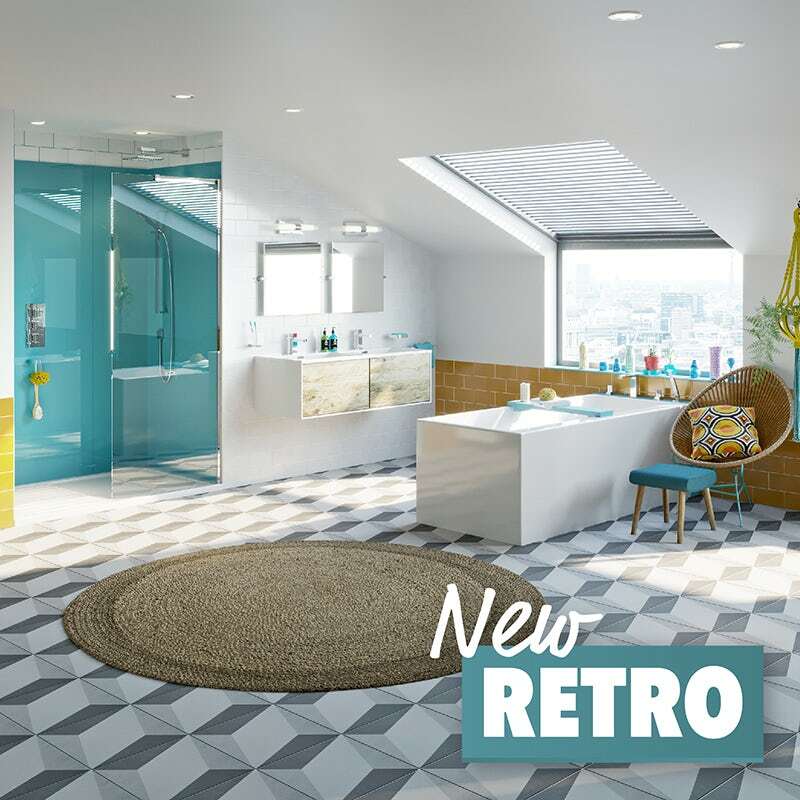 In part 2 of our "Get the look" style guide, we'll show you how to create your own New Retro bathroom, using the right products to capture the perfect look.